We are a small, family-run dog and cat emporium. Our goal is to bring a delicious twist on quality food to dog and cat owners looking to give more than traditional brands have to offer. Our food and treats are made with top quality (human grade) ingredients packed with vitamins and minerals to help your pet lead a happy, healthy life. We offer many foods that are organic, gluten-free, and/or non-GMO. Looking for affordable, healthy alternatives to mass-produced pet foods? You have found your store. 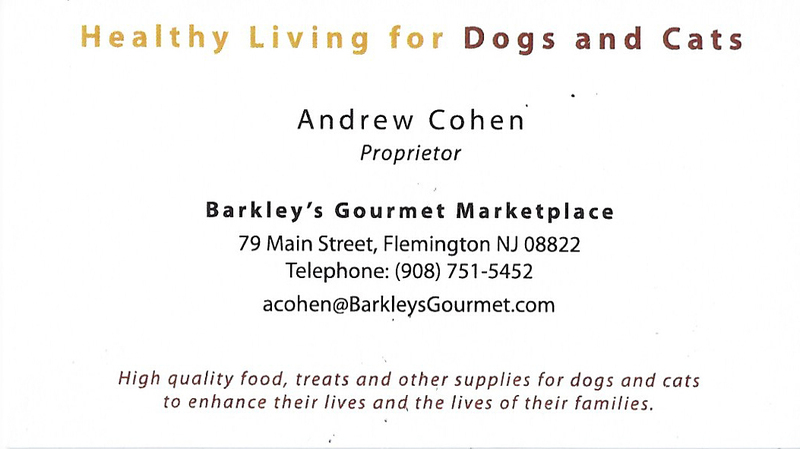 Barkley’s Gourmet strives to provide the leading, most nutritionally balanced food and treat options. We want to bridge the nutritional gap left behind by so many pet foods on the market today. The high standards and food safety protocols our brands provide means that your food and treats will always be of the best quality and most important of all, made with safe ingredients. A beautiful boutique in Historic Flemington, NJ with a surprisingly large selection of really great products. When people ask us why we decided to open Barkley’s Gourmet Marketplace, we tell them about our family experience. Bringing rescued pets into our home and loving them like family has opened our hearts, brought us in touch with the community and, most assuredly, added to the fun factor in our lives. Now, we want to share the wealth of good feeling that has elevated our family life. 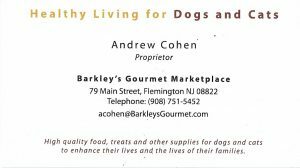 Barkley’s foods will enhance and extend the life of your pet. And because your dog or cat will be eating better, you can expect fewer eye infections, hot spots, digestive issues, and food allergies… not to mention, fewer veterinarian bills. Homemade Assembled Foods – Our all-natural prepared foods are baked on premises and stored in the refrigerated and freezer sections of the store. Choose pork, beef, peas, carrots, brown rice, whatever your pet loves. The only difference between Barkley’s homemade pet food and human food is seasoning. There are no sauces; no garlic, basil or even salt. It’s pure beef, chicken or pork, smoked or dried, and offered with a selection of cooked vegetables. Pre-Packaged Foods are selected for their taste and nutrition and sold in regular or bulk quantities. Raw Diet Products, found in our freezer section, come in pasteurized and unpasteurized varieties. Treats – Our bones are the real thing, from local farms, not manufactured rawhide. There’s also beef or chicken jerky and a mouth-drooling assortment of special biscuits, baked right here in small, super-fresh batches to be sold the same day. 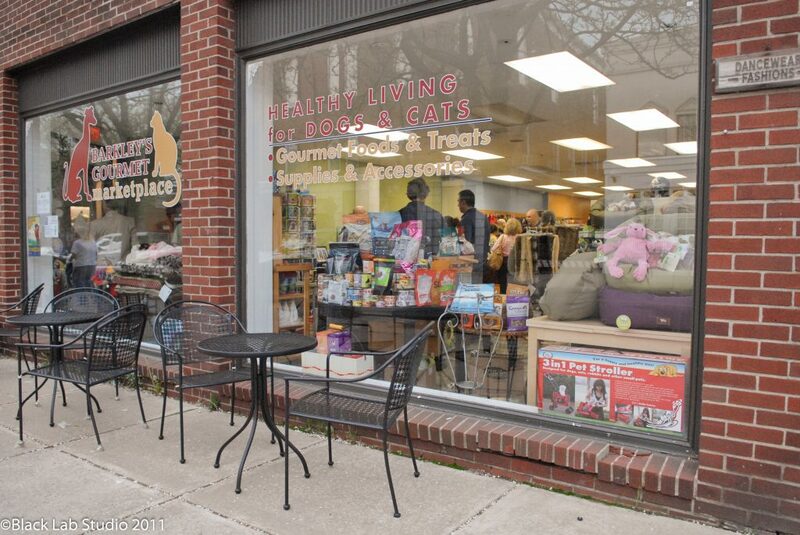 “Barkley’s has an amazing selection of the healthiest foods for our dog. We love how they took the time to evaluate what we had been feeding Brutus and showed us a healthier, affordable option.